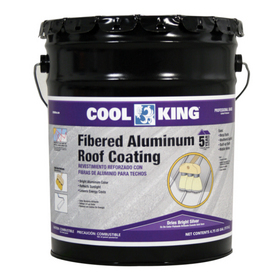 Protects roof surfaces, Superior reflectivity, Bright aluminum color, Saves energy! This premium energy saving formula stays brighter longer. It will seal, protect and reflect solar heat using a proven blend of selected waterproofing asphalts, fibers and high grade leafing aluminum pigments. Forms an excellent adhesive bond with most substrates. Areas immediately under roof will remain approximately 15-20 degrees cooler in the summer. In winter, inside heat is reflected back into the building, thus saving energy costs. Dries silver.